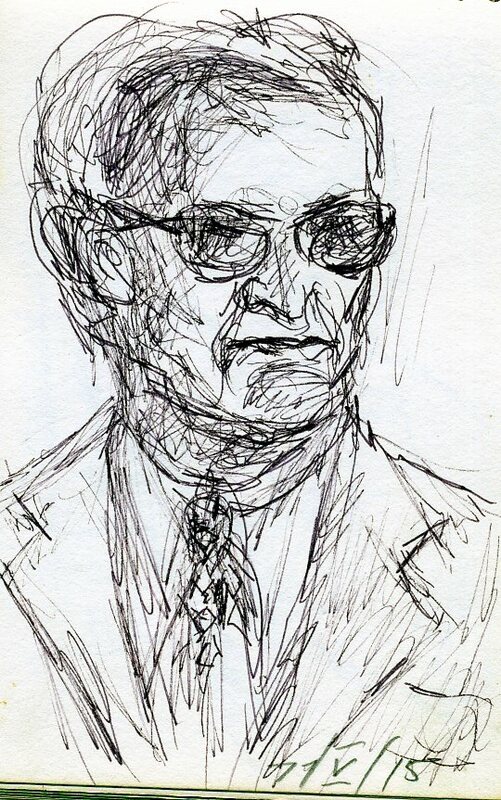 All of the previous recordings in this blog of the Bukovina singer Lifshe Schaechter-Widman [LSW] are from the 1954 recordings done by Leybl Kahn. But her daughter Beyle Schaechter-Gottesman recorded a few songs from her in the 1960s and early 1970s. This lullaby was recorded a few months before LSW died in 1973. As usual, the transcription in English letters more accurately reflects her dialect than does the Yiddish transcription in the Yiddish alphabet in which we use standard Yiddish. Shluf mayn feygele makh tsi dayn eygele. veln mir beyde geyn pasn di shuf. *(German: säle) the usual Yiddish plural of “zal” – a large room, ballroom would be “zaln”. 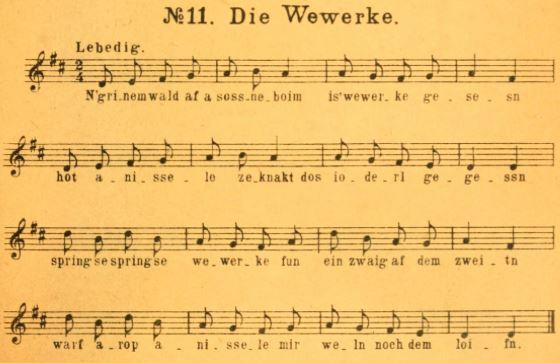 LSW uses the more Germanic form, perhaps the local Yiddish Bukovina form, to rhyme. Sleep my little bird, close your eye. Sleep my little crown, you are someone special. This week’s Yiddish Song of the Week features a performance of Der heyliker moshiakh (The Holy Messiah) by New York-based Yiddish singer Josh Waletzky, recorded at the Center for Traditional Music and Dance on January 28, 2011. 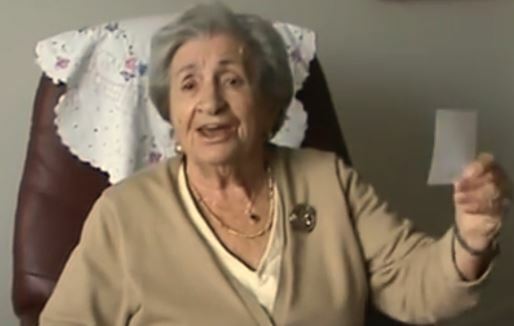 The song is from Waletzky’s family repertoire (his family referred to it as “The Name Song”); Ruth Rubin collected the song from Waletzky during her fieldwork at Camp Boiberik. 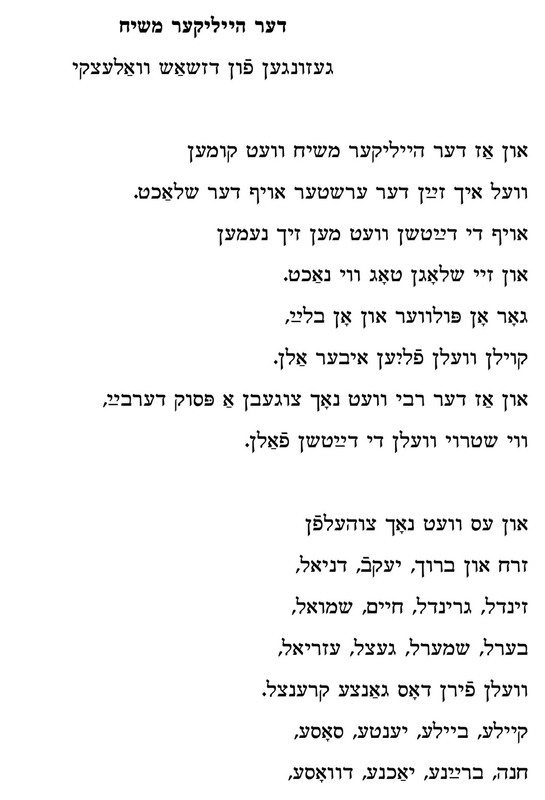 I have attached a variant of this song as found in Noyekh Prilutski‘s collection Yidishe folkslider volume one, Warsaw, 1914. Number 61 (pages 90 – 91). There is no melody given in Prilutski‘s volume, so thanks to Waltezky we have one now! So Prilutski believed that the song was Hasidic, not Maskilic (anti-Hasidic), and perhaps he had even seen it performed by Hasidim? 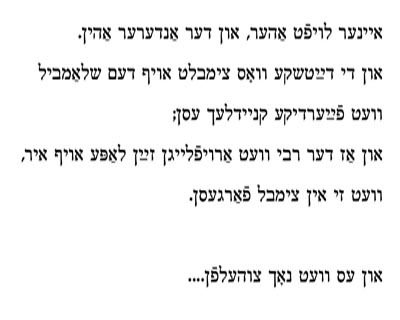 That would not be shocking, since it was common for similar parodic anti-Hasidic songs such as this, written from the point of view of Hasidim, to be ‟misinterpreted‟ as pro-Hasidic, pro-rebbe. The classic example is Velvl Zbarzher‘s Kum aher du filosof which was recorded in a typically lyrical fashion by Theodore Bikel. Is it mis-interpretation? ‟Reinterpretation‟ or just plain ‟interpretation‟ would be preferable. The singer, whose context and audience varies from that of the composer, gives the song a different meaning through his performance. 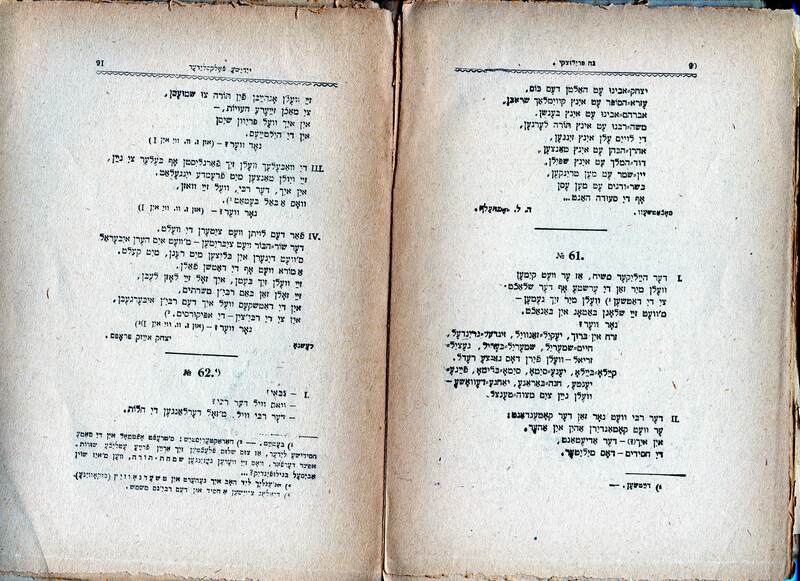 Waletzky clearly sings it as a parody in the way the Maskilic composer wrote it, and the song has several of the subjects of satire that the maskilim often mocked about the traditional shtetl life: the blind devotion of the hasidim to their rebbe, the fanatic anti-modern/progress attitude (e.g., mocking the popular secular dance kadril ‘quadrille’ as shmadril, which also alludes to the word for converting, shmadn), and the highlight of the song, the satirizing of Yiddish names that comprises the refrain. Notice that in Prilutski‘s version there is no reference to shmadril but non-traditional dance is mentioned (Zey veln tantsn mit fremde yunge-layt / They will dance with young strangers). vel ikh zayn der ershter af der shlakht. un zey shlogn tog vi nakht. koyln veln flien iber aln. vi shtroy veln di daytshn faln. I will be the first into battle. And beat them day and night. Bullets will be flying everywhere. The Assimilators will drop like straw. veln firn dos gantse krentsl. der rebe vet zayn der komendant. er vet komedirn ahin un aher. af di drabes, af di hultayes. The Rebbe will be the commander. He’ll issues orders this way and that. On the freethinking prostitutes and adulterers. zey veysn nit vos zey zoln tin. eyner loyft aher, un der anderer ahin. vet zi in tsimbl fargesn. They won’t know what to do. One runs this way and the other runs that way. Will eat hot matzo-ball ammo. She’ll forget all about her tsimbl*. Zorekh and Baruch, Jacob, Daniel..
Tsunye Rymer was born in Krasna, Ukraine (Yiddish “Krosne”) and grew up and learned to drink among Bratslaver Hasidim in town. 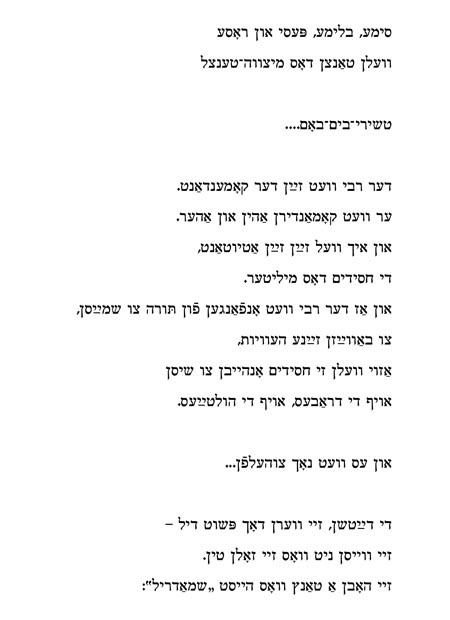 He was an incredible reciter of Sholem-Aleichem. He memorized 20 monologues, because he thought he was going blind in his youth (he lost vision in one eye), and wanted to entertain himself in later years. Two LPs of his recitations were produced and you can hear them on the Judaica Sound Archives website. Rymer loved to party, and his gregariousness is reflected in his expressive and passionate singing style. He was a mainstay in our Yiddish cultural world in the Bronx centered at the Sholem-Aleichem Folk Shul 21 on Bainbridge Avenue. He owned a dry cleaning store. Rymer died in 1995, I believe, in his early 90s. One point of Yiddish grammar that is confusing in the song. A scissor in Yiddish is feminine „Di sher.‟ According to the Uriel Weinreich dictionary, the dance is masculine „der/dem sher.‟ Rymer mixed up the two genders, as you can hear. 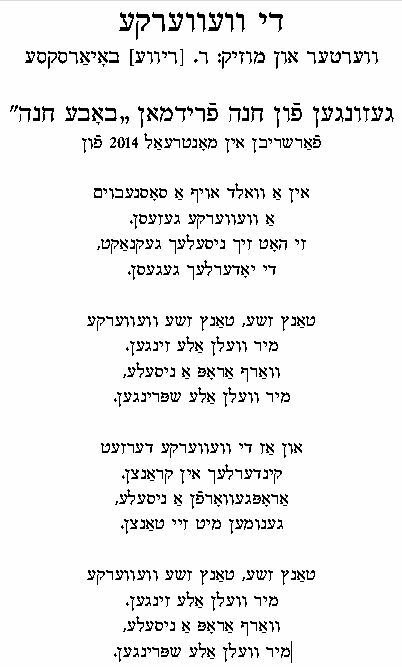 The folksong „Shpilt zhe mir dem nayem sher‟ (“Play for Me the New Sher”) has been recorded by Ruth Rubin, Masha Benya and Shura Lipovsky. Rymer‘s last verse is different from theirs. This recording of Rymer was made at a zingeray at the Gottesman home in the Bronx in 1988. Pete Rushefsky adds: The music for „Shpilt zhe mir dem nayem sher‟ is familiar as the opening sections of the well-known sher medley played in New York City, also collected in Belarus by Sophia Maggid in 1934 from Dovid Veksler, an amateur violinist from Mozyr, Gomel oblast (I thank Dmitri Slepovitch for this information). Sher is the quintessential East European Jewish square dance. Given the length of time required to dance a sher (often 20-30 minutes or more), klezmer musicians would string together a variety of different melodies into a medley to accompany the dance. Over time, these medleys became codified, with different communities adopting unique sher medleys. For more information about sher, see Walter Zev Feldman’s entry on “Traditonal Dance” in the YIVO Encyclopedia. Additionally, Hankus Netsky has documented the evolution of the sher medley known to Philadelphia in his Ph.D. dissertation, “Klezmer: Music and Community in 20th Century Jewish Philadelphia” (Wesleyan University, 2004). Ikh hob zikh farlibt in a yingele. Ikh ken tsu im nisht kumen. That has just come out. But I cannot go to him. Shem ikh zikh far layt. but he lives very far. But I am ashamed in front of people. Az keyner zol nisht zen. Dos yingele iz shoyn a zeyde. Di alte iz shoyn oykhet groy. A lebn af zey beyde. The boy is now a grandfather. May they both live a long life.